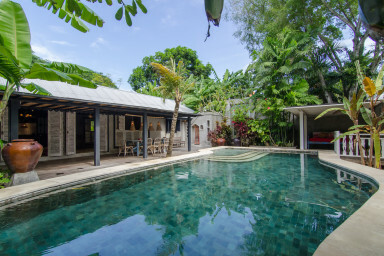 The Boho-Chic Villa Pulau 4 is located in the heart of Seminyak’s happening area where the beach is walking distance and KUDETA can be reached in less than a minute. With aqua-marine tone private swimming pool, Al Fresco dining area to his & her washbasins’ bathrooms, this vacation rental is also lavished with handmade unique decors that you can shop from the villa. Only minutes of walking distance to nearest local restaurants and mini mart.